If I’m not wrong, there are a few grammar dictionaries/guidebooks written in English but none that I’ve seen so far is as comprehensive and detailed as those written in Korean. It’s a all-in-one book, so you just have to search the index for the grammar point you are looking for. No more flipping through various textbooks and wondering where you have learnt that grammar construction. The explanations given here are much more detailed as they include a breakdown of the grammar construction. This is then followed by its meaning and several examples to illustrate its uses. What I really like about this is how they are additional notes for certain grammatical constructions. In these notes, they sometimes compare similar grammatical constructions, but highlighting the differences in the uses/nuances. The dictionary did fail me a few times but I would say it’s a very comprehensive and detailed collection of the grammar constructions of Korean. 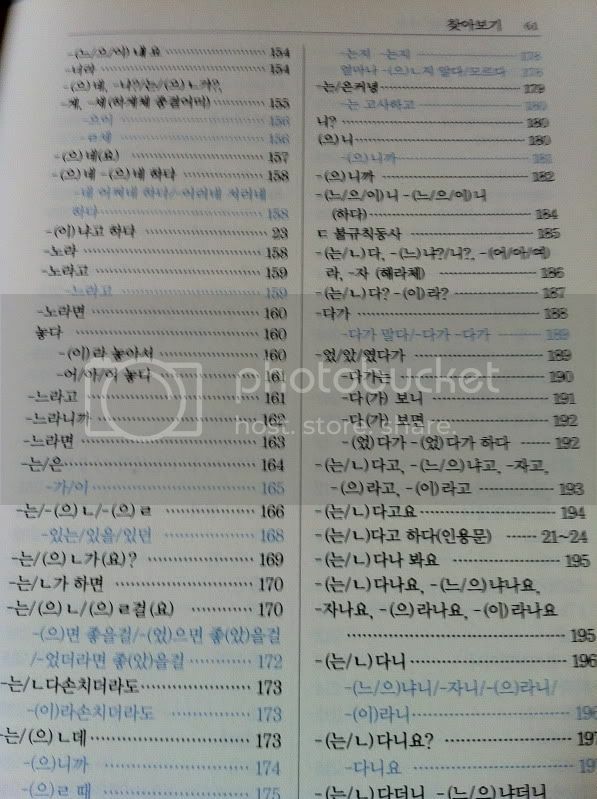 ^^ There is a section in front that gives some background details on the Korean language and other useful information. I have yet to read it (ㅠㅠ) but here’s a pretty useful piece of information! It is a table that tells you when to use the sino-korean numbers and when to use the native numbers! Why not? 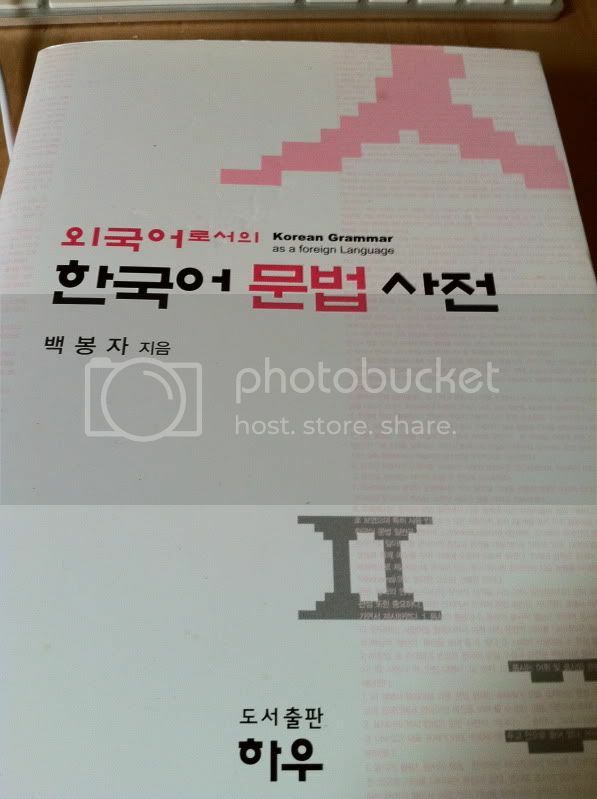 English grammar books for second language learners are written in English, so why shouldn’t Korean grammar books be written in Korean too? like what you said, those books are usually meant for 2nd language learners. You wouldn’t really expect foreigners who are learning korean as a foreign language to be able to use the book unless they are advanced learners. I’m saying it will be great if there is a more comprehensive grammar dictionary written in english than what is currently available. I’m not quite sure what you are saying. A foreign language can be a second language(L2) or a third or fourth. Korean in my second language and I am a foreigner, thus Korean being a second and foreign language to me. There are tons of books about English grammar written in English also, one of the most popular being ‘English Grammar in Use’. These are specifically designed for people learning English as a foreign language. 2nd language is used for learning a language which is also spoken in the community that you are living in while foreign languages are languages that are not used in the local community. That’s how we use the terms in linguistics. I know what you mean. I am just saying that they are not suited for the beginner/lower intermediate learners. Yup I’ve seen that book that you have mentioned. It is not as comprehensive as the korean ones. Oh that’s cool! ^^ Did you specialised in any area of linguistics? I wished books aimed at elementary-intermediate books have more detailed descriptions. It’s pretty annoying to think that you have mastered a grammar construction and later find out that there are certain nuances or that it differs from another construction that was said to be interchangeable. I particularly enjoyed phonology and took all the courses I could in that area. I don’t remember too much though as it has been a few years but I still enjoy it. Korean Language Education is still in its early stages but I feel confident that it will grow to become a lot better with constant globalisation and a new generation of teachers. Since it’s still in its early stages there are so many books out there but many have strange and useless things in them. At university(not in Korea) we were made to study the historic language in the drama 대장금 while most of the class could barely hold a conversation in Korean! Personally I feel grammar is a topic which you can only explain so much. There are so many exceptions and anomalies to grammar structures in any language so it is impossible to cover all situations.Nevertheless, I do agree that they could do better on things such as nuances and situations. Grammar books should specifically mention which grammar structures are used commonly and which are not. Which are used, for example only in books or written form etc. Still, even if you perfectly memorise a REALLY good grammar book, you can only learn it properly by listening, using and experimenting for yourself. Language and in this case, grammatical structures can have emotions and culture hidden inside them which one has to feel for themselves. The problem is that this takes a lot of time. Yup I agree about the need to specify which grammar structure are the commonly used ones. I find myself using some constructions that are more suited for formal prose and I’m lucky my korean friends pointed that out to me! Oh I was going to ask you to review this book! I was looking for it in 교보 and Libro after I saw it last night and there’s no stock in my area so I have to find it in other book stores. My 교포 friend is going to buy me this book though I can’t wait to get it so maybe I should but it myself. I’m just wondering what instances did the book failed you? hi there may i know where do you purchase this book from? I already have two other grammar books, but after reading your review I caved and decided to order this. I can hardly wait to get it! that makes 2 grammar geeks xD which other grammar books are u using? perspective on how difficult aspects of the language should be handled and presented when taught to foreigners. I ordered from 교보문고, but unfortunately they didn’t have any previews of the pages, so I did a bit of searching and found the website above. hey shanna! not sure if you saw my reply on my post but the comments got deleted by blogger =/ so lousy. anyway yeah! we must meet when i’m back (: and go for more interesting food haha ^^ i’m meeting my friends in HK so i’ll fly there directly haha (: and all the best for your exams! Do you know the three-book Japanese grammar dictionary series? The first one is called, “A Dictionary of Basic Japanese Grammar.’ I’m studying Japanese, and these have been by far my favorite resource. Have you come across anything like that for Korean grammar? It sounds like you haven’t found anything you consider thorough enough, but any recommendations are appreciated! this one is pretty thorough and I like it! There’s another good one called 외국인위한 한국어 문법사전. (in korean though) most of the good grammar dictionaries are in Korean! Thanks! I bought this book after reading your review. (Without your post I wouldn’t know it existed). The first time I opened it, I thought, wow, it’s all hangeul! Can I really use it at my level? At first it was very hard to understand the explanation, but soon I got used to the linguistic terms used in the book.I love it.